The jam ends (TO-Jam 8th edition, 2013), the game is ready and we’re rather proud of the result! But it’s still far from the product we are currently shaping, since last summer, it has been in constant evolution! Here is the first part of the story of this evolution. 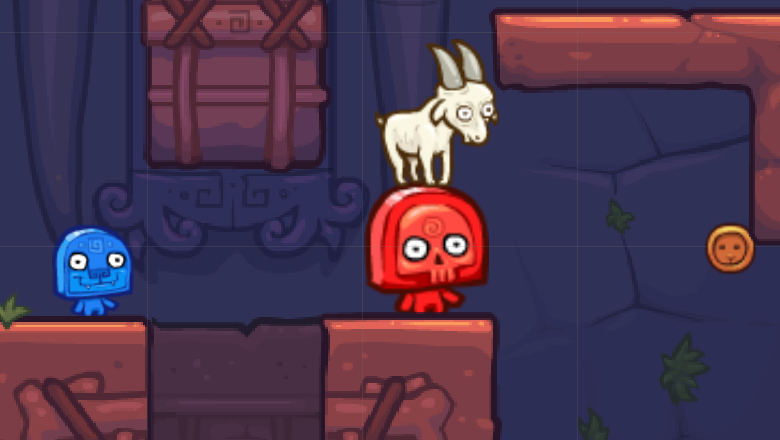 At the TO-jam presentation, we mainly noticed that the game was bringing smiles on the faces of people, but while we enjoy seeing people enjoying the game, we notice that it’s hard to steal the goat: the target is quite small and mobile. It happens more than we’d like that the goat stays on the same head for most of the match. Furthermore, when we play, we notice few instances of the character not jumping or dashing when we want it to. So here, for our first iterative enhancements: the player who has the goat is slowed down and is bigger, we also want the game to be as exciting as possible, to keep players on the edge of their seat every game, this requires the game to help the less experimented players to win, a rubber band system. For the not responsive controls, we determined that it was because the game was so frantic that we just could not keep track of our number of dash or mid-air jumps, so screw it, the player will be able to dash or double jump whenever he wants. 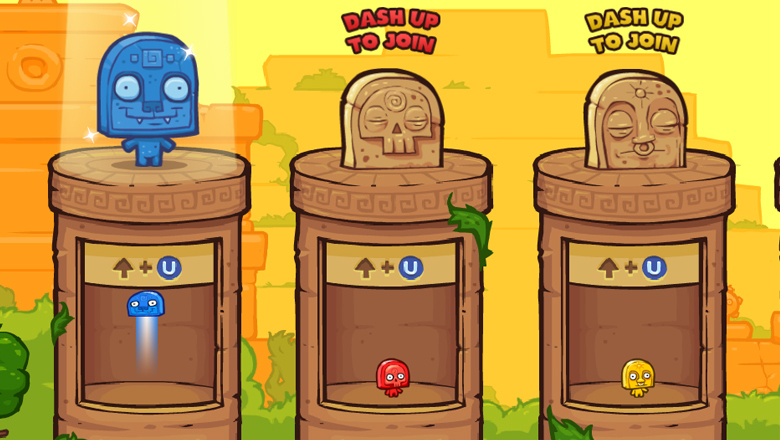 Now the player can double jump between every dash ,dash as much as he wants and cancel the dash with a jump and so on. Now, the game feels much better! The excitement of having the goat is made accessible to everyone, and the reward of getting it is felt much more often, but never less rewarding! (*It turns out it was less rewarding because you had the goat way less time, we fixed this in the future… Does this even make any sense?) The reward comes with keeping the goat for extended periods of time now, because the points that the goat gives per second increases with the time you consecutively carry the goat. 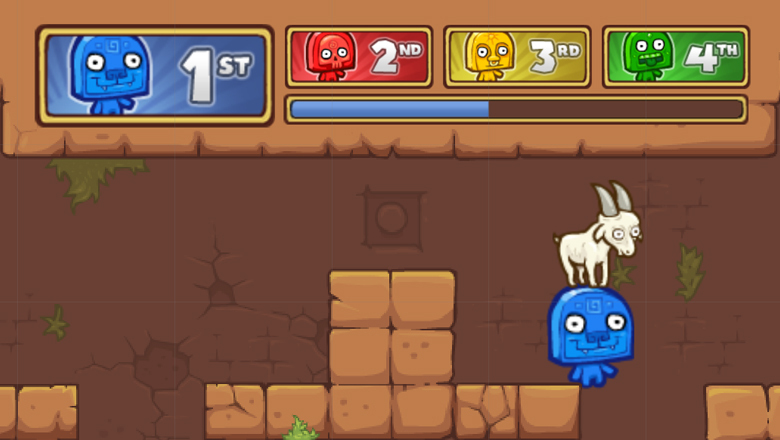 Furthermore, to even out the scores and make the player positions swap as often as possible, each time the goat is stolen, it removes half the points it gave to it’s carrier and transforms them into coins, for every player to collect. The toto with the goat is all swollen, go relieve him, little blue! We then presented it at the Gamercamp in Toronto, still, many players liked the game! (yay!) But STILL, we saw flaws: a game could last forever without ever advancing if everyone was good to catch the goat and some other times, the game would be rather short, the gap between the players score was too big, removing excitement factor, moreover the fact that the goat removes half of the points it gave when it is stolen makes for final scores that were less tight as thought in game, disappointments ensues. But the biggest flaw we saw was that some players needed to be told how to play by us; the game did not teach well enough how to play. So here comes another iteration: remove the goat removing points (no more disappointing final scores), the goat no longer give more points per second the more time you carry it (evens the play time through sessions), We stepped up and made the rubber band system shamelessly visible by making the goat give points per second according to your ranking. And after debate, we decided that the best way to teach the players how to play, how to use dash, left, right, up down, was to make the player use this mechanic in order to even be able to play, in the character selection screen, where you can make cold headed decisions and thus are more prone to learn and experiment rather than mindlessly try anything in a hurry. 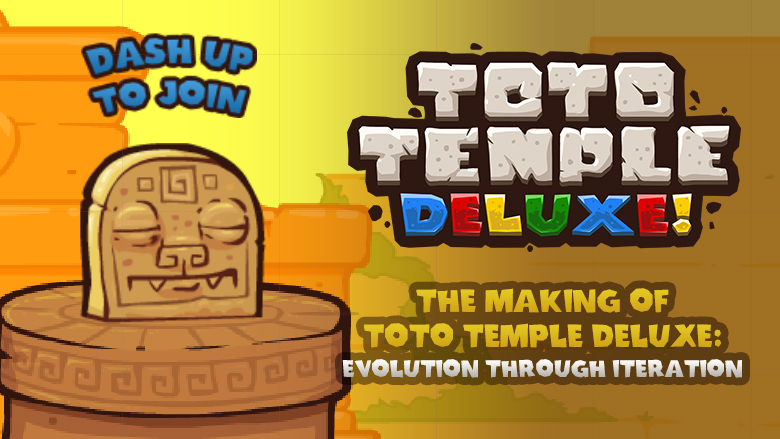 Now that you know that you can dash up, you can use this new knowledge in the game! So this is it, we give you the basics of the recipe of a Juicy Beast game in the making, as you can see, ease of use and the “ the player must bother with absolutely nothing other than it’s goal” feel are prevalent values in our games, stay tuned to see how we will stay true to those rules of thumb while adding on a ton of new contents! I really enjoyed reading these making of posts 🙂 Downloaded the game and enjoyed the controls as well! Oh thanks! The controls in the available online version are nowhere neat the quality of those of the retail game releasing soon! (2014-07-24) The online version had minor bugs that I figured out after. great design lesson here 🙂 looking forward to buy the game.